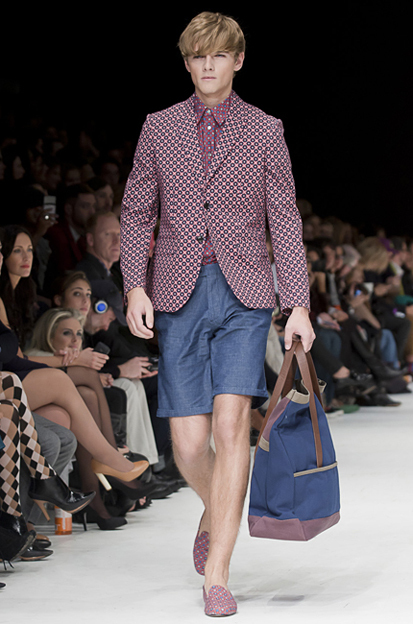 The Spring 2012 collection from Antonio Azzuolo delivers classic pieces impeccably tailored for the sun loving gentleman. 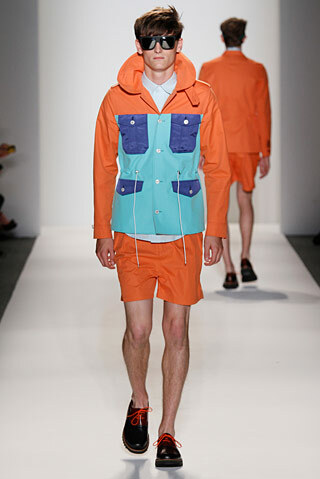 Long shorts, hemmed and not, anchor trim blazers and bright anoraks. Double breasted jackets are slim, while pants are light and loose. Azzuolo sells us summer in a clean and sophisticated package. Tan sold separately. 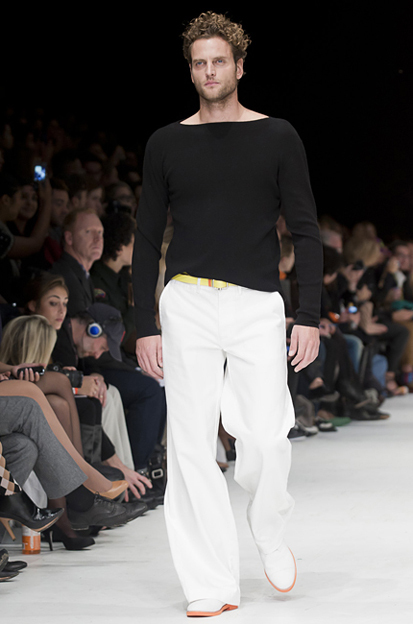 Nothing says summer like white pants, especially in a loose fit with a nice drape. 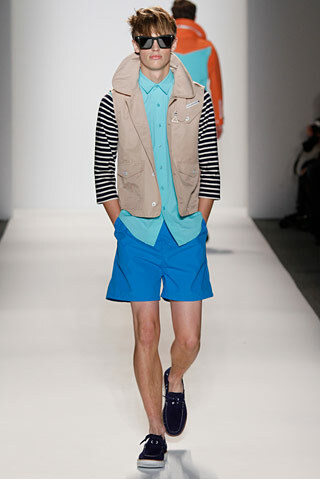 The short vest under the longer jacket is the perfect play on proportions. 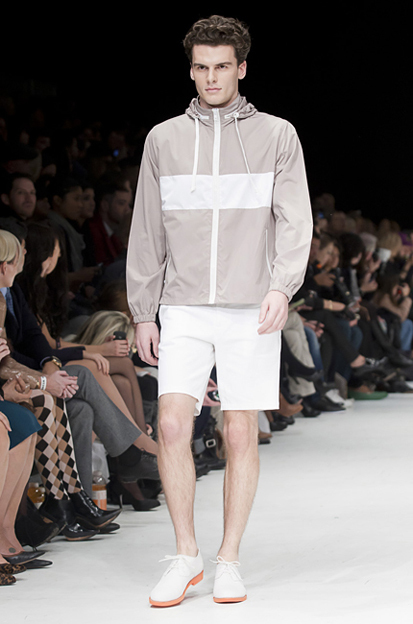 The unfinished hem of the shorts is a clever foil to this classic look. Love the tortoise shell sunglasses? Here’s a similar pair from Warby Parker. In case you’ve been someplace without printed media, television, or the Internet, double breasted jackets are back. The new DB has been slimmed and trimmed to give every man a great shape. H&M welcomes you to the band wagon for just $60. For the timid gents among us, a great way to diffuse a bold color is pairing it with black. 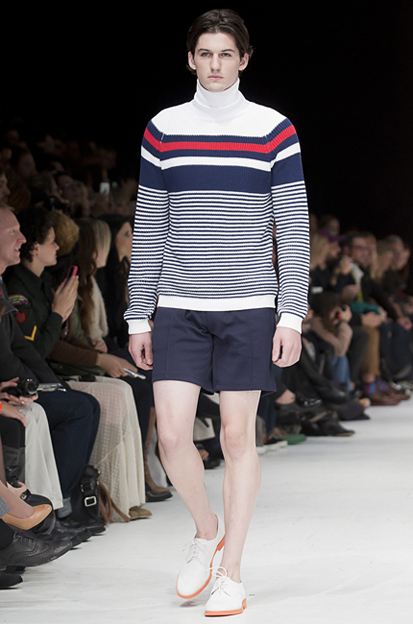 The nautical stripe is the summer pattern. 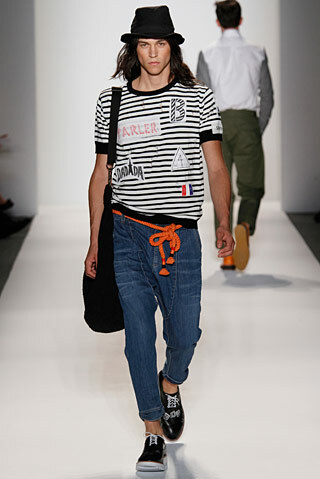 The Saint James tee from J.Crew exemplifies this trend. 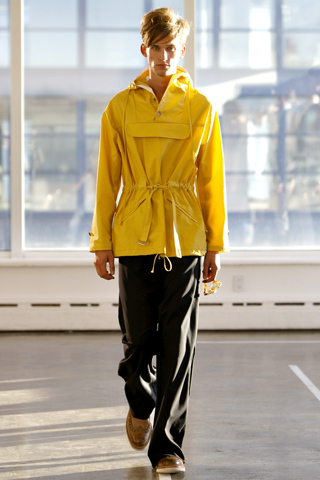 Anoraks are the jackets of the season. They’re lightweight, easy to throw on, and handy for those pesky pop up showers. 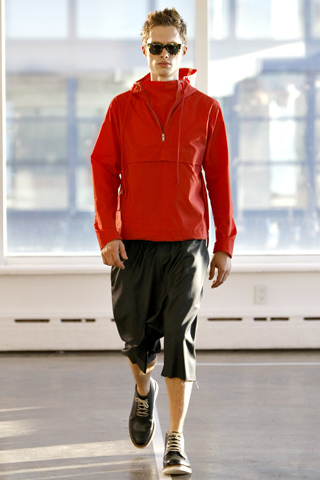 A hooded nylon zip up, like one from Old Navy, is a great alternative to an anorak. Just think color. Bright color. While I don’t wear shorts myself, I can appreciate the perfect pair. Check out this offering from Express. 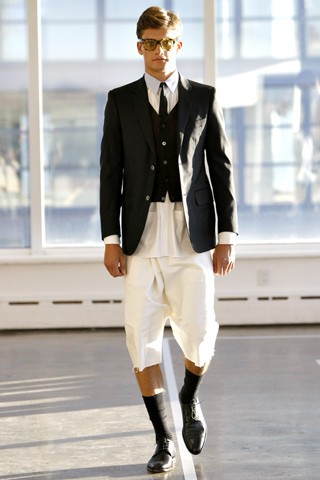 Wear this to those half dozen summer weddings you’re getting dragged to this year. I guarantee you wont’t regret it. While listening to the Scissor Sisters recently, I couldn’t help but remember the collection that had prompted my love affair with the band: D&G Spring 2007. 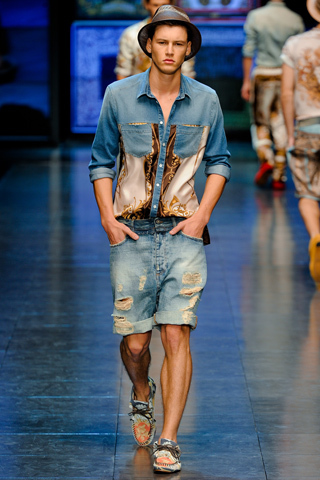 This is arguably one of D&G’s wilder collections, not that I’m not applauding it. In fact, I think it’s incredible. The zebra prints, fluorescent tights, corsets, and spiked heels combine to create an army of Mad Max neon vixens marching down the runway, ribbons in tow. It works. I don’t know how, but it works. And the entire trek is set to the undeniably catchy “I Don’t Feel Like Dancin'” by the Scissor Sisters. 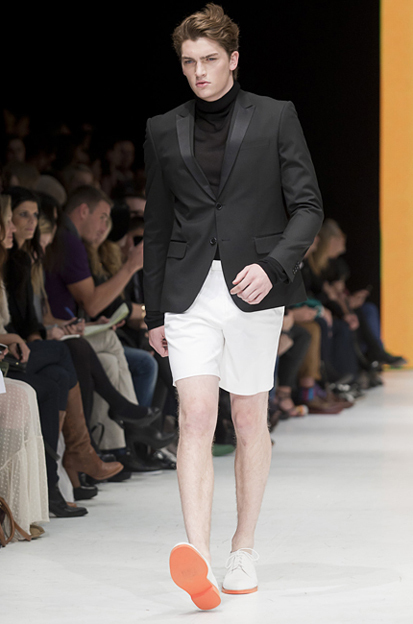 I know I’m straying from my menswear roots, but sometimes it’s nice to mix things up. A gentleman doesn’t discriminate. This one’s for you, ladies. Watch the entire show here, although the quality leaves something to be desired. 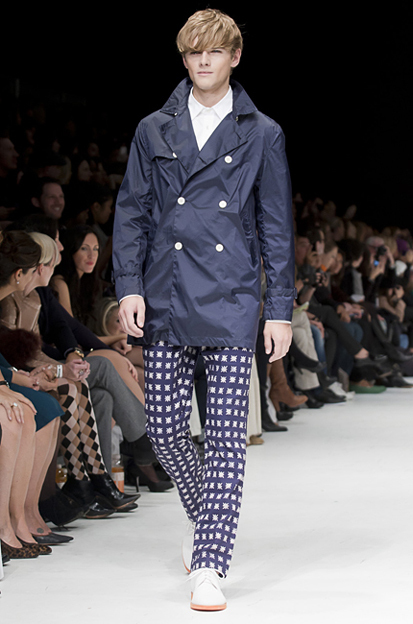 When I first saw the Fall 2011 collection from General Idea last February, I was admittedly not familiar with the brand. 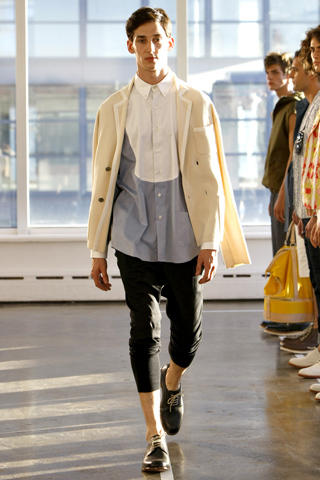 The Korean menswear label immediately grabbed me with its ingenius mix of high fashion and practicality. 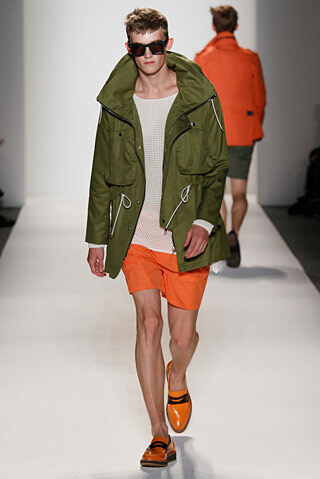 The line was a refreshing blend of traditional plaids and khakis with clever outerwear and re-interpreted camo prints. 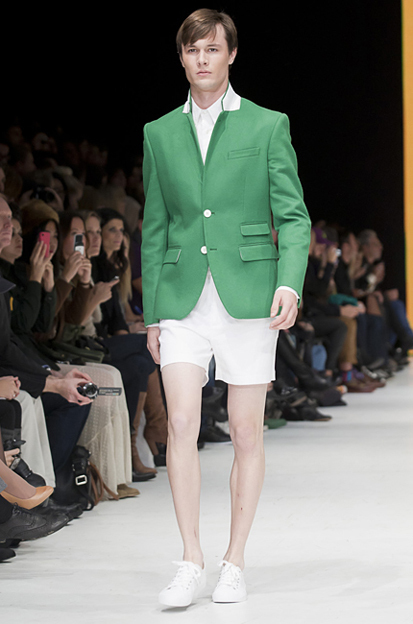 And while the collection was clearly design oriented, everything seemed surprisingly wearable. 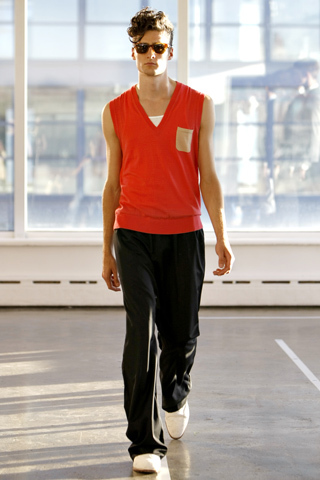 Fast forward to the Spring 2012 show and the same can still be said. 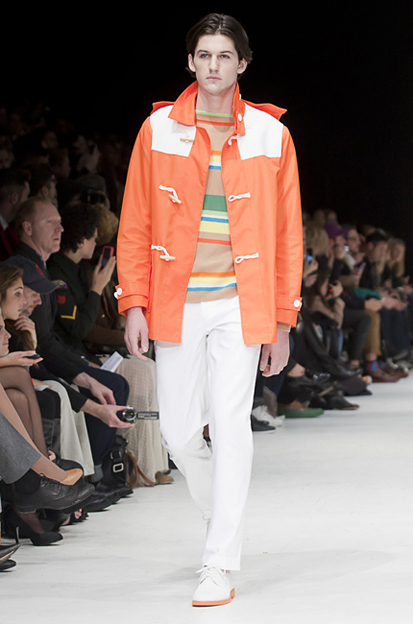 Bright colors are paired with bold stripes and muted neutrals. The use of color is often brazen but never overwhelming. 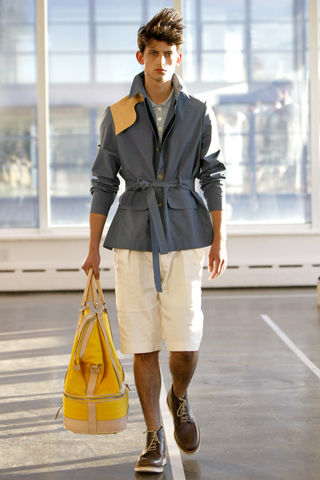 The jackets are ridiculous, in a good way, eliciting thoughts of lounging on a sail boat off some beautiful coastline. But make no mistake, the ship has definitely not sailed on General Idea. 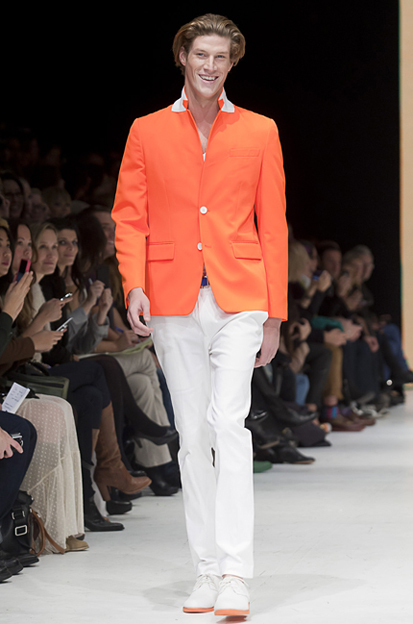 This color blocked jacket sets the tone for the entire collection. I love the stripes and the mix of blues is simple but really smart. I fully endorse a good tie tuck, especially when said tie is bright orange. 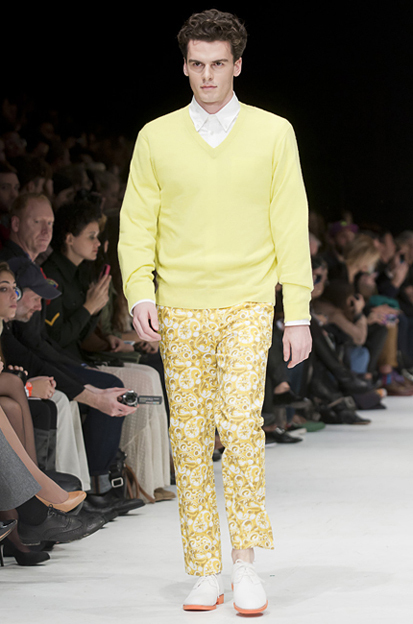 While the jacket and pink collar are exceptional, the neon belt is a perfect pop of color. This is not your typical nautical. It’s better. I can’t get over those jeans and belt (as I Google “neon cord”). Before I saw this collection, I wasn’t an orange person. Mea culpa. These colors pair perfectly together; one doesn’t overpower the other. Keep an eye on General Idea as it continues to do everything right. When it was confirmed last year that the D&G line would be closed down and merged into its parent Dolce & Gabbana, I was devastated. 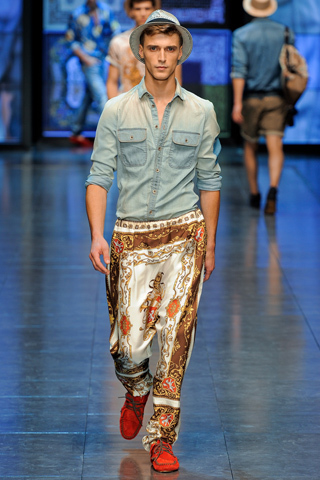 D&G had been one of the primary brands attracting me to menswear. 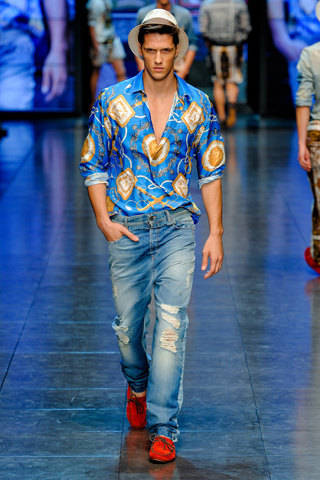 With its vibrant, youthful feel and brazen attitude, the line was a distinct departure from the less playful, often slightly austere collections from Dolce & Gabbana. And while Stefano Gabbana and Domenico Dolce assured the fashion world that the decision was to add “even more strength and energy to [their] collections,” I saw no hint of D&G anywhere in the Fall 2012 show this past January, the first collection since the brand’s dissolution. I found myself missing the cheekiness of D&G that had defined the brand for years. 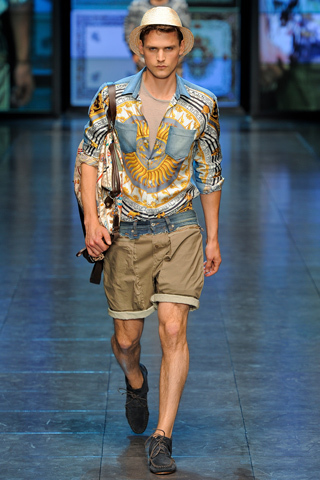 To pay homage to D&G’s Spring 2012 collection, its finale, I’ve assembled my favorite looks from the runway. 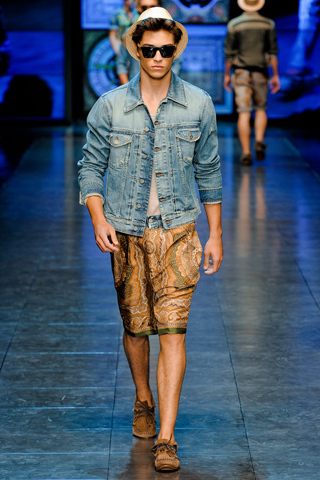 The show was rich with vibrant Moroccan prints and light, heavily distressed denim. 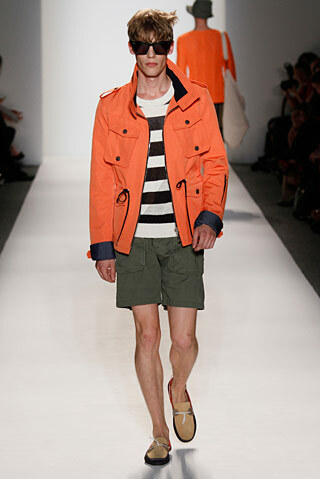 It is a quintessential summer collection and a fitting farewell to an incredibly influential brand. 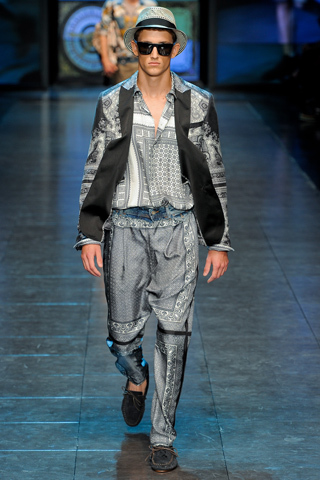 I couldn’t get over the the denim waistbands mixed with the silk prints. It’s absolute genius. 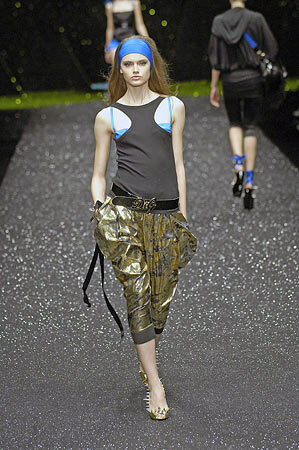 Those denim waistbands are insanely clever, a trait inherent in all of D&G’s collections. Guys, if you don’t have a faded denim shirt, get one immediately. For the next 6 months, it will never look wrong. 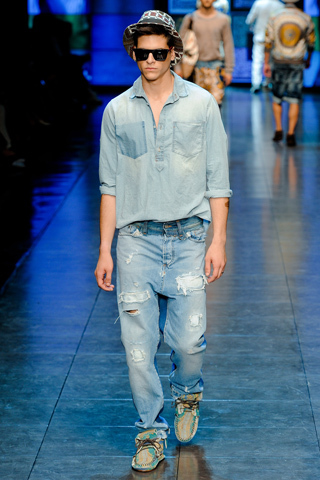 And while you’re at it, grab a pair of loose fitting ripped denim in a medium blue. It’s hot outside, so it’s okay to betray your skinny jeans for awhile. 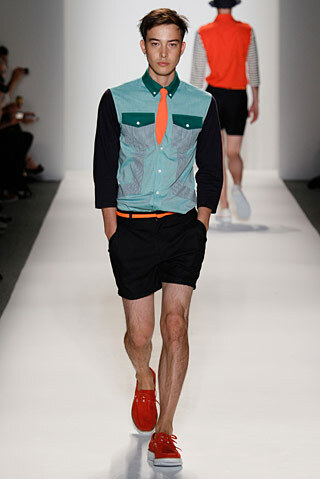 When denim shorts initially resurfaced on runways several seasons back, they were short, tight, and generally terrible. A loose fitting pair is a much better option and works on almost every guy. Denim on denim? Cool on cool. 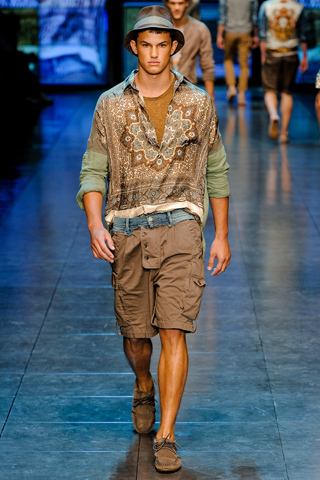 Gentleman, cargo shorts can be stylish! An added plus is that they can be purchased everywhere and on any budget. Find, steal, or purchase a denim jacket this year. Medium is good. Lighter is better. So long, D&G. I’ll catch you on the fashion flip side.